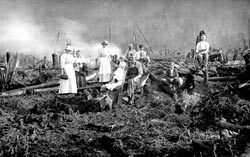 Hearty folks who braved the mountainous terrain to harvest the abundant forests settled Morton in the late 1880s. By 1894 Morton had grown to such an extent that it started a school, taught by a teacher who came by horse from Napavine. Thirteen students attended school at the Burnap home, a two room cabin. A dance hall was built that summer and was used as a school room until a log school was built in 1896. Morton was plotted in 1911 by pioneers Thomas Hopgood, Robert Herselman, and Pius Cottler. Cottler was the first settler in 1877 to homestead property that now lies within the city limits of Morton. Incorporated on Jan 6, 1913 and named after the country’s current Vice-President Levi Morton, the city developed into the business center for East Lewis County. Morton was named “the railroad tie capital of the world” because it housed the world’s longest tie docks. The city continues today as primarily a timber based economy. 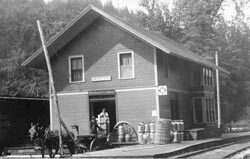 The Tacoma Eastern Railroad gave a huge boost to the growth of this rural town of only 100 people. Two trains a day arrived from Tacoma. One of the first steam powered locomotives rolled into town in 1910. About this same time a vein of cinnabar was discovered and within a few years Morton was considered the mercury capital of the United States, producing more than any other deposit in the world. In 1924 a fire tore through town leveling 19 of the 23 businesses in the business district. A few years later in 1933, flooding caused extensive damage, yet the town of Morton preserved and continued to survive. This comm unity is never at a loss for stories. One that lives on is the story of T.A. “Al” Peterman who came to harvest logs from Cottler’s Rock during the Great Depression. The innovative man began buying surplus trucks and modifying them so they would hold better on steep hillsides. After a few years he bought a factory in California to produce quality trucks known today as Peterbuilt Trucks. Today as you approach Morton from the west on US Hwy 12, a section of the road is referred to by the locals as Peterman Hill.